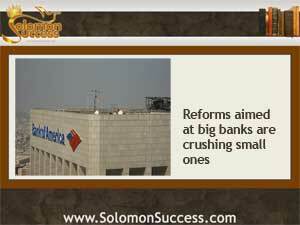 King Solomon has harsh words about those who deceive and lie – and judging from the recent spate of lawsuits, the nation’s big banks certainly fit that description. But the sweeping reforms enacted in an effort to restore accountability in the finance industry may be having the unintended consequences of destroying many of the country’s smaller banks and limiting options for mortgage seekers. As we’ve reported here before, the aftermath of the housing collapse of 2008 put the big banks – those deemed “too big to fail” – in the spotlight for a variety of bad banking practices ranging from wildly inappropriate mortgage loans to outright fraud. As more and more incidences of deceit such as the “robosigning” scandal and interest rate manipulation came to light, a string of lawsuits, many pressed by the US Department of Justice, followed. These cases mostly ended in settlements, with banks like Bank of America, Citigroup and JP Morgan Chase paying millions to customers bitten by their bad practices. But another outcome was the creation of the Dodd Frank Wall Street Reform and Consumer Protection Act, popularly known as the Dodd Frank Act – a sweeping piece of legislation that imposed numerous new regulations and penalties on the financial industry. The goal of Dodd Frank was to protect consumers from the kinds of manipulative and fraudulent practices that led to the housing crash, and to hold banks accountable for their behavior. Dodd Frank provisions included new standards for mortgage lending and new penalties for banks that ignored them. The big banks, with masses of resources and legal teams at their disposal, absorbed the Dodd Frank changes with relative ease. They’re too big to fail, remember? So even with the extensive list of changes imposed by the Dodd Frank Act’s numerous new sub-acts and watchdog groups, for these megabanks business continues relatively unchanged. But according to a new post from Money Morning, for smaller banks and financial groups, the slew of new regulations is becoming too much of a burden, one that’s crushing their ability to keep on doing business as usual. These small local banks don’t have the resources to stay in compliance and handle the consequences if they aren’t. New lending standards are limiting the number of new customers and these institutions are often too small to qualify for a bail out. Many smaller regional banks have been absorbed in mergers with larger ones. Others have simply closed their doors. And, say financial experts, that’s closing the door to loan applicants and banking customers who may not be able to meet the standards imposed by larger banks, or who have special needs that a local bank could handle. Zeiler, David. Three Charts That Show How Dodd-Frank Is Killing Small Banks. “ Money Morning. MoneyMorning.com 7 Mar 2014.